Vitamin D is a hormone that promotes intestinal calcium and phosphorus absorption and reduces urinary calcium loss, thereby supporting optimal levels of serum and tissue calcium and healthy bone composition. Vitamin D3 is naturally produced in human skin in the presence of UVB light. There is a growing recommendation for 20 minutes of sun exposure daily (without sun cream but outside the intensive period of midday - 3pm) as this is estimated to produce 2,000 i.u. vitamin D3 in the body. Vitamin D receptors are found on most cells in the body, including immune cells, lymphocytes and macrophages. Vitamin D is essential for maintaining healthy bones and teeth, for normal functioning of the immune system (including the inflammatory response to wounds and infection), and for supporting normal cell division. Vitamin D3 deficiency is pandemic, due in part to the modern-day indoor lifestyle, to the use of sunscreen and due also to dietary changes. 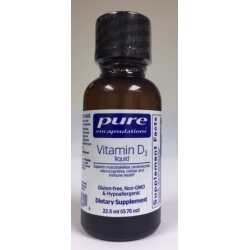 Pure Encapsulations Vitamin D3 liquid provides 1,000 i.u. per drop, an ideal daily amount. For the elderly, Vitamin D3 liquid is an easy to use form. 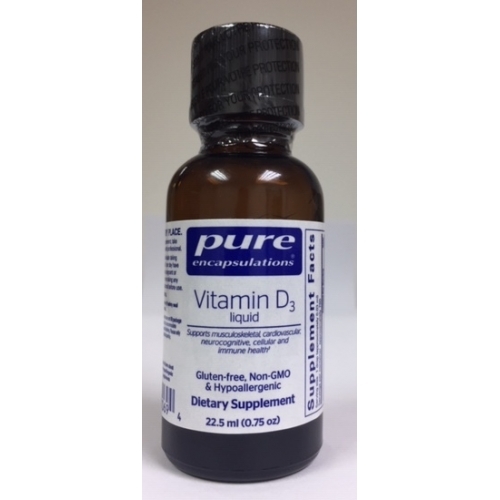 Vitamin D3 liquid, in a base of medium chain triglycerides, does not require emulsification for absorption. Vitamin D3 liquid is also free of preservatives, artificial colors, flavours and sugars. It is recommended that individuals using more than 2,000 i.u. vitamin D per day have their blood levels monitored regularly. Caution: accidental overdose of liquid vitamin D products can lead to serious adverse effects in infants. This product is not intended for infants. The recommended daily dose of vitamin D for infants is 400 i.u. per day. If pregnant or lactating, consult your health professional before use.